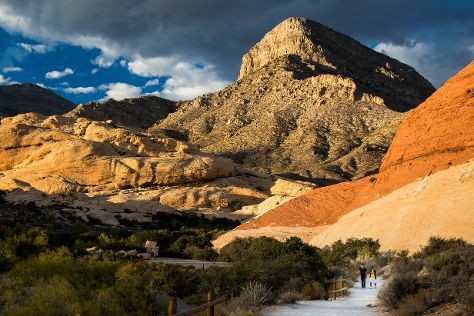 Kick off your visit on the 16th (Thu): see the interesting displays at The Mob Museum and then take in breathtaking views at Red Rock Canyon National Conservation Area. On the 17th (Fri), you'll have a packed day of sightseeing: shop like a local with The Strip, then enjoy breathtaking views from Eiffel Tower Viewing Deck, then admire the natural beauty at Bellagio Conservatory & Botanical Gardens, and finally ponder the design of Bellagio Fountains. For ratings, other places to visit, reviews, and tourist information, you can read our Las Vegas day trip app . In May, plan for daily highs up to 87°F, and evening lows to 64°F. Cap off your sightseeing on the 17th (Fri) early enough to travel back home.